SANTA CLARA, CA -- Defiant, and determined to be a conduit for U.S. change, Colin Kaepernick plans to sit through the national anthem for as long as he feels is appropriate and until he sees significant progress in America - specifically when it comes to race relations. He knows he could be cut by San Francisco for this stand. Criticized, ostracized, and he'll go it all alone if need be. The quarterback realizes he might be treated poorly in some road cities, and he's ready for that, too, saying he's not overly concerned about his safety, but "if something happens that's only proving my point." "I'm going to continue to stand with the people that are being oppressed," Kaepernick said Sunday at his locker. "To me this is something that has to change. When there's significant change and I feel like that flag represents what it's supposed to represent, this country is representing people the way that it's supposed to, I'll stand." Two days after he refused to stand for the "The Star Spangled Banner" before the 49ers' preseason loss to the Packers, Kaepernick insists whatever the consequences, he will know "I did what's right." He said he hasn't heard from the NFL or anyone else about his actions - and it won't matter if he does. "No one's tried to quiet me and, to be honest, it's not something I'm going to be quiet about," he said. "I'm going to speak the truth when I'm asked about it. This isn't for look. This isn't for publicity or anything like that. This is for people that don't have the voice. And this is for people that are being oppressed and need to have equal opportunities to be successful. To provide for families and not live in poor circumstances." Letting his hair go au natural and sprinting between drills as usual, Kaepernick took the field Sunday with the 49ers as his stance drew chatter across NFL camps. He explained his viewpoints to teammates in the morning, some agreeing with his message but not necessarily his method. Some said they know he has offended his countrymen, others didn't even know what he had done. "Every guy on this team is entitled to their opinion. We're all grown men," linebacker NaVorro Bowman said. "I agree with what he did, but not in the way he did it," wideout Torrey Smith said. "That's not for me. He has that right. Soldiers have died for his right to do exactly what he did. ... I know he's taken a lot of heat for it. He understands that when you do something like that it does offend a lot of people." Both Bowman and Smith are African American. Kaepernick criticized presidential candidates Donald Trump ("openly racist") and Hillary Clinton;" called out police brutality against minorities; and pushed for accountability of public officials. "You can become a cop in six months and don't have to have the same amount of training as a cosmetologist," Kaepernick said. "That's insane. Someone that's holding a curling iron has more education and more training than people that have a gun and are going out on the street to protect us." In college at Nevada, Kaepernick said, police were called one day "because we were the only black people in that neighborhood." Officers entered without knocking and drew guns on him and his teammates and roommates as they were moving their belongings, he said. He said his stand is not against men and women in the military fighting and losing their lives for Americans' rights and freedoms. Kaepernick, whose hair had been in cornrows during training camp, sat on the bench during Friday's national anthem at Levi's Stadium. Giants wideout Victor Cruz and Bills coach Rex Ryan said standing for the anthem shows respect. "There's a lot of things that need to change. One specifically? Police brutality," said Kaepernick, whose adoptive parents are Caucasian. "There's people being murdered unjustly and not being held accountable. People are being given paid leave for killing people. That's not right. That's not right by anyone's standards." On Sunday, he stopped briefly on a side field to talk with Dr. Harry Edwards and they shared a quick embrace before the quarterback grabbed his helmet and took the field. Edwards is a sociologist and African-American activist who helped plan the "Olympic Project for Human Rights" before the 1968 Mexico City Olympics, where U.S. sprinters and medalists Tommie Smith and John Carlos bowed their heads through the anthem on the medal podium in their black power protest. After swirling trade talks all offseason following Kaepernick's three surgeries and sub-par 2015 season, he has done everything so far but play good football - and he doesn't plan for this to be a distraction. Coach Chip Kelly did not speak to the media Sunday. 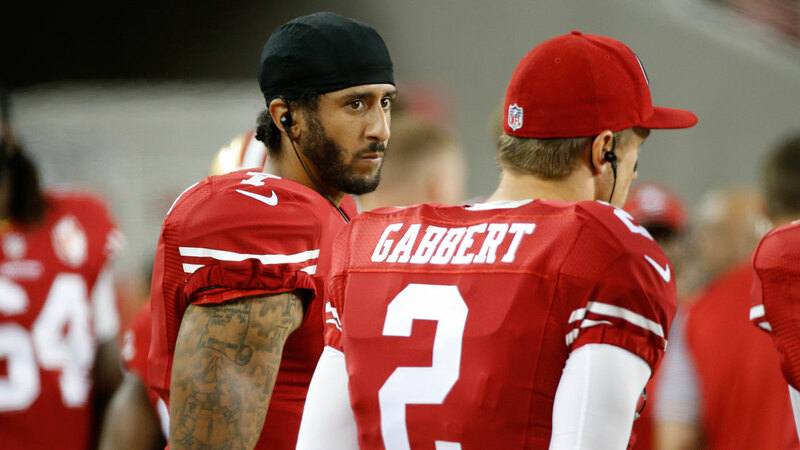 He said Saturday he still hasn't decided on his starting quarterback in a competition between Kaepernick and Blaine Gabbert, who took over the job from Kaepernick last November and has vowed to be the No. 1 again. Kaepernick hasn't stood for the anthem in any of the team's three preseason games "and I don't see it as going about it the wrong way." "That's his right as a citizen," Kelly said. "We recognize his right as an individual to choose to participate or not participate in the national anthem." Now, Kaepernick is prepared for whatever comes next. "At this point, I've been blessed to be able to get this far and have the privilege of being able to be in the NFL, making the kind of money I make and enjoy luxuries like that. I can't look in the mirror and see people dying on the street that should have the same opportunities that I've had."